Forrester recognizes two lowcode platform types, one targeting business users and the other for application developers. But for many applications, the MVP can be developed on platforms and with tools that enable rapid development. I've been writing about lowcode, citizen development platforms and feature this in my book, Driving Digital: The Leader's Guide to Business Transformation Through Technology. - What IT Takes to be a Citizen Developer on Low Code Platforms? Now Forrester has published two Waves, one for lowcode platforms that target business developers (ie, citizen development platforms) and a second for application developers. They place Quick Base, Caspio, and MatsSoft at the top for business users with Kintone, FileMaker, Microsoft and Nintex as contenders. 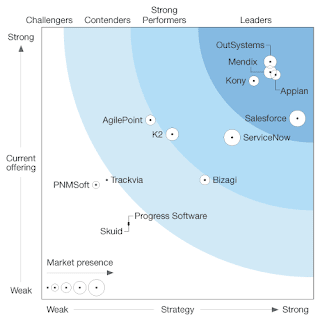 For application developers, Outsystems, Mendix, Appian, Kony, and Salesforce are at the top with ServiceNow, AgilePoint, and K2 as contenders. I myself have developed a good number of applications on lowcode platforms including enterprise tools for portfolio management, hiring/interviewing, and IT budgeting. Many of the business platforms aim to enable business users to develop workflows and knowledgebases that work better than spreadsheets and email while providing richer collaborative experiences than messaging applications. They enable the development of web and mobile user interfaces that have both workflow and collaboration capabilities. The lowcode development platforms often include capabilities to integrate with other enterprise systems, databases, and APIs. They often enable developing an experience that can be optimized for phone, tablet, and web. These lowcode platforms also tend to have application lifecycle capabilities so that applications can be developed and tested outside of production environments. As I discuss in Driving Digital, these platforms should be part of every CIO's digital transformation agenda. If you're going to enable the workforce to work smarter and faster, then it requires developing digital tools targeted to each department's need. For example. sales, marketing, operations, and financial teams all have different needs when accessing ERP, CRM, and marketing systems. If application development is easy and economical then developing experiences that target the end users' needs likely increases utilization and improves productivity. In addition, workflows developed by sharing spreadsheets or emailing other office documents is error prone and can be less productive. Many of these lowcode platforms are used to develop applications where ones never existed, or can be used to phase out workflows on old legacy systems. So if the IT department is overwhelmed, if your organization is inundated with manual or email driven processes, or if you are looking at too many point SaaS solutions for limited-need workflows, then instrumenting a lowcode platform may be a sound investment. Great article, should stop the discussion about whether or not Citizen Developers are useful. Kudos to Forrester for this.